QFC has a One Day Only Flash Sale for novelty summer toys, happening today only (7/7)! 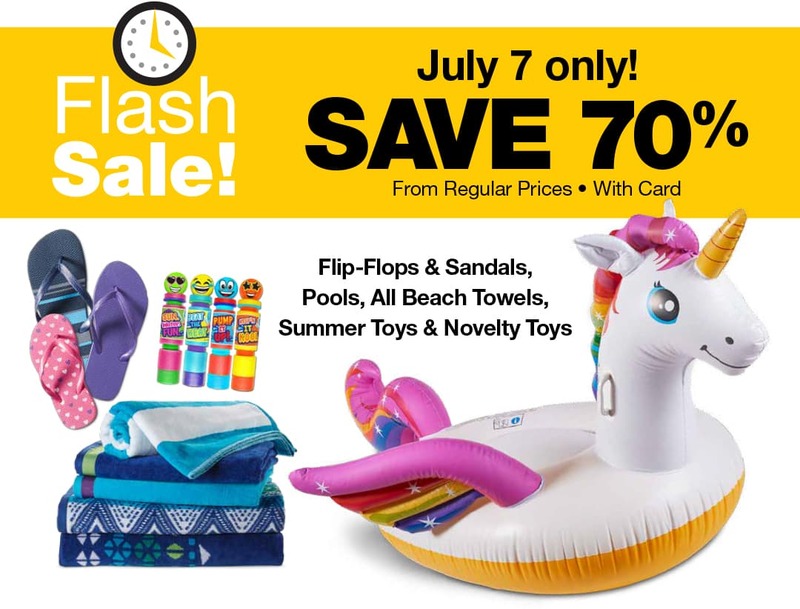 Get 70% summer toys, towels, flip flops, pools and more. My local QFC has an aisle that they usually carry these items, as well as special displays throughout the store. Be sure to check end caps for these deals too. When they go 70% off, you can get some super deals. If you don’t see signs, make sure to ask as sometimes they may still be in the process of putting out the signs, but it will ring up on sale. Make sure you have signed up for the QFC Advantage Card as you will need that (or the phone number you signed up with) at checkout to get the discounts applied. Remember that selection is limited to stock that is on hand at the store, so I’d get to your store early on if you are wanting the best selection. Let us know what kind of deals you find in your store? Disclosure: this post has been sponsored by QFC. Please see our Disclosure Policy for more information.